MTH Electric Trains held a series of dealer previews from February 1st to the 4th in Columbia, Maryland. Each seminar lasted for a day and a half. Dealers were provided with meals and accommodations. The The most buzz was generated by the new control system , new sound system and new starter sets. "All of the dealers were in shock," said Tony Walis of America's Best Train and Hobby Shoppe. "Not just at all the new things MTH has developed, but also the delivery date of June 2000." Lou Capone of Loco Louie's Model Trains in Holmes, Pennsylvania agrees. "Mike's whole presentation was first-class. The seminar was informative and there was lots of exciting products. The new electronics just floored me. Unbelievable." Mike Wolf did most of the talking. He talked about the new products, the future of MTH, and how his goal was to put an MTH train under every Christmas tree in America. How will he do that? By offering better trains, lower prices and more features than any other train manufacturer in any gauge. "I bet you guys sold a lot less HO trains this year," Mike said to the crowded room. The dealers looked among each other and nodded. O gauge is indeed the hot model railroad gauge again. MTH is offering a brand new line of starter sets. These are headed by locomotives like the S-2 turbine, GS-4 and N&W J. They are referred to as "Baby" locomotives and are smaller than the previous RailKing versions. There's a new McDonald's train as well. "I think the McDonald's train is great and will be a great seller," commented Lou Capone. "Every kid knows McDonald's." Mike discussed MTH's Dealer Locator and Product Locator services on the Internet, which are available to anyone in the world 24 hours a day. The Product Locator is an organized network of MTH products. Dealers send a list of items they have (with their retail price) to the Product Locater. Then, both dealers and customers can quickly find the items they are looking for. After dinner, the dealers gathered around a long 6' X 50' demonstration layout with a single loop of track and a graduated trestle section. Here Mike demonstrated the new products. One new feature is called Loco-Speed Control. Locomotives can electronically maintain speed over grades without racing away. But the biggest news here MTH is considered second-best to Lionel: sound and control systems. First, the sound systems. Starting with the items from the last catalog, locomotives will come with ProtoSounds 2.0. This new sound system contains features never before seen or heard in the world of toy trains. For example, Proto-Doppler. This is the sound effect of a locomotive whistle or horn passing the listener. When you are next to real tracks and hear the horn blow, right as it passes, there is a drop in pitch and tone. This change in pitch and tone is called the "Doppler effect." Proto-Doppler recreates that effect. Proto-Dispatch allows the operator to record their own station announcements and yard dispatching calls. Proto-Cast allows the operator to hook a CD player or phonograph and play it through the locomotive speaker. In addition to these features, there are new whistle/horn sounds, bells, squeaking brakes and clicking rail sounds. Audio samples will soon be available on the MTH website. The control system is called Digital Command System, or DCS. Like Lionel's Trainmaster Command, MTH's DCS includes a walk-around multi-function remote controller. 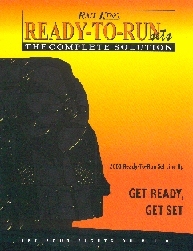 To implement DCS, an operator will also need a Track Interface Unit, or TIU. For accessories there is an Accessories Interface Unit, or AIU. MTH's new system is easily installed, is compatible with most transformers, regardless of manufacturer, and is compatible with many other manufacturer's trains. It will run Lionel Command-Equipped locomotives. "I believe the new MTH system will win over those who were skeptical of the new electronics," said Lou Capone. "It's easy to operate, the features are great, and you get a lot of bang for your buck. The doppler sound feature is incredible. I also liked the variable smoke unit controls, and the scale MPH readout." For a full list and description of these features click here. The presentation concluded at about 10:00 pm. The next morning buses shuttled dealers to the MTH headquarters, about 10 minutes away. Dealers were given a complete tour of the offices, service areas, warehouse, studio, and test facilities. There was some fun too. Some dealers were asked to read lines for possible future Proto-Sound recordings. Dealers were given two new catalogs, Vol. 2 of the RailKing and Premier/Tinplate Traditions lines. 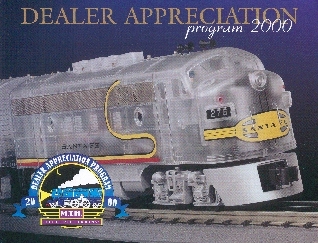 They also were given a new Dealer Appreciation 2000 catalog, a new train set catalog and a short video that demonstrates the new features. Tony Walis thinks MTH did a fine job. "Mike has revolutionized the train industry and has single-handedly brought it into the 21st Century. He is on a one-man mission to make toy trains a major part of the American landscape...again. No other company has that same passion, excitement, vision and drive." Lou Capone, who has seen a lot of trains come down the track and who doesn't impress easy, said, "It was totally impressive.